OnePlus 5T finally delivered what the fans were longing for, with an almost perfect phone. But, many users may have missed out on buying the phone, from the two flash sales which the company held on November 21st and 24th respectively. If you were one of the fans who couldn’t buy the phone during those sales, there is good news for you, as the OnePlus 5T is now permanently available on open sale in India. 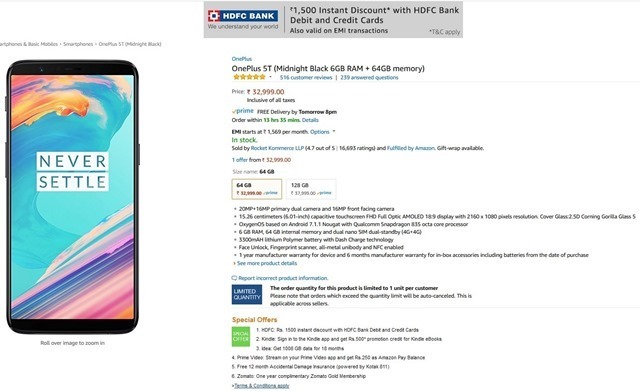 You can buy the phone from either the OnePlus Store or Amazon India. There are some good offers for the phone on both online stores, such as Rs. 1500 cashback (it’s actually an instant discount) for purchases made with HDFC Debit Cards and Credit Cards. This offer is also valid on EMI transactions too, though there is no 0% EMI. For more information about the OnePlus 5T, refer to the launch article for the device.